Mr. Happiness - The Las Vegas personality who entertained passing motorists at Sahara and Ft. Apache. From the early to mid 2000's through 2011 or so, Mr. Happiness was a staple for motorists passing through the intersection of Fort Apache and Sahara Ave. 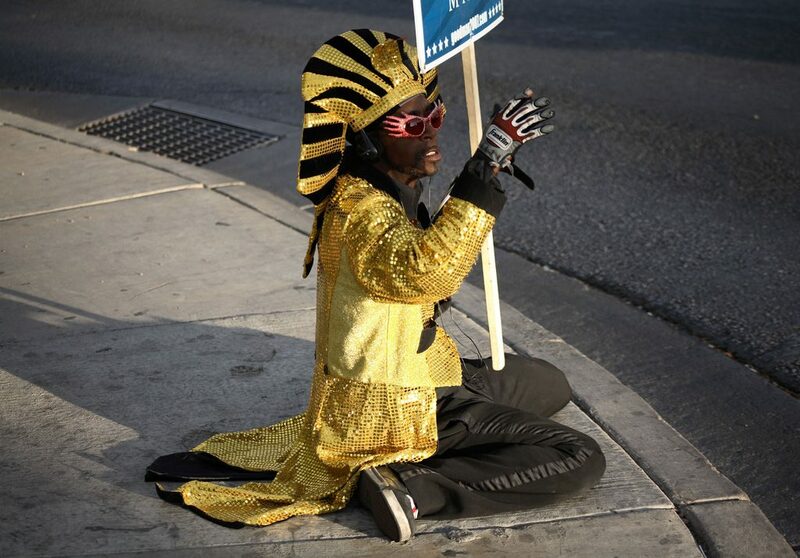 Dressed in a variety of outfits, Mr. Happiness, or Larry Johnson as he's known in real life, would sing, dance, wave and play instruments in an effort to spread happiness to passing motorists. Mr. Happiness became one of the better known Las Vegas eccentric personalities carrying out his goodwill each and every day from 10:00 AM until sometimes 4 and even 6 into the afternoon. Name: Larry Johnson, aka Mr. Happiness. Age: Mr. Happiness turns 64 years old this year. Early life: Larry's life wasn't always filled with happiness. Born in Louisiana and growing up in East Oakland, California, he had three sisters born addicted to heroin from their mother's drug use. Larry, himself, was illiterate at a young age and fell into a life of crime until he turned his life around by joining the army. "Laguna Larry": After twenty years serving his country, Mr. Happiness spent 16 years in Sacramento where he was known as "Laguna Larry" for doing the same corner performances in one of its suburbs, Laguna. Las Vegas & "Mr. Happiness": Larry moved to Las Vegas in 2002 and decided a name change was in order, stating a 5-year old girl once told him he made her happy. The notion stuck with him and he became known as Mr. Happiness to Las Vegans as he spread cheer almost daily on the corner of Fort Apache and Sahara Ave for the better part of a decade. The media in Las Vegas started covering him in 2002 and it didn't take long for him to become something of a cult icon Mr. Happiness was always adamant about spreading cheer for free and not doing it as a paid gig, noting he could probably do so on the Strip if he wanted to go that particular route. However, by 2011 his sightings became less frequent, some having spotted him on different corners doing rumored promotional work. The last information I could locate on a sighting of him in public spreading his cheer was 2012. If anyone has seen him since, please feel free to leave a note in the comments. UPDATE: Mr. Happiness appeared on one of Chopper's Auto Show in 2017 (video below). The Bet: In 2005, then Las Vegas mayor Oscar Goodman lost a bet with 94.1 local radio personalities Mark and Mercedes and danced with Mr. Happiness on his corner, raising $2,000 for Make-A-Wish foundation. 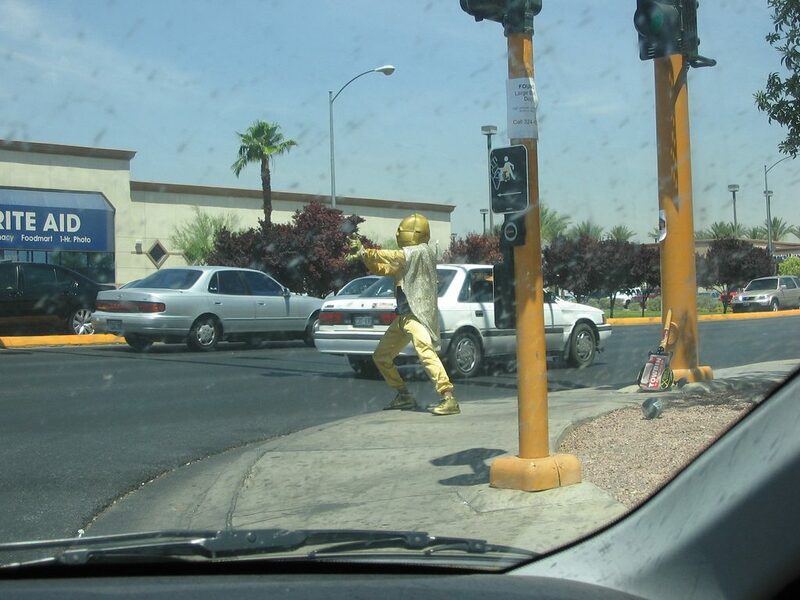 Mr. Happiness goes all out C-3PO for motorists passing by.